Fat loss is a tricky problem for almost everyone. Of course we all want to get rid of unwanted fat on our bodies, but it is not as easy as “eat less, move more.” There is far more to it than that. Before you dive into the tweaks needed for this, familiarize yourself with our quick start guide. This will refresh your memory on how to begin your journey and what to expect. One of the main aspects to consider in this is a metabolism reset. This will be your biggest supporter to a successful cut phase. When the time comes to reduce calories and begin your fat loss phase, cutting requires only a small amount of calories to be removed. We are talking 5-15% from your TDEE. 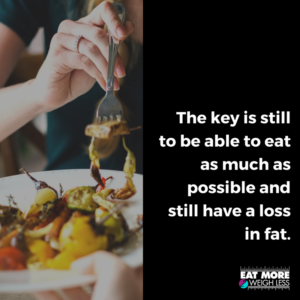 The key is still to be able to eat as much as possible and still have a loss in fat. Following a 4-6 week cut phase, a jump back up to your TDEE level is necessary to remind the body of where maintenance is. Think about it. If you cut your intake to a specific number, and do nothing more, then your body will adjust to that lower level and that becomes your new “normal.” Then when the plateau hits (which it always does) calories need to be slashed again in order to see a loss. Each step down will cause the metabolism to slow, thus making it harder and harder for fat loss to happen. Just like your body adjusts to calories going down – it will adjust to calories going up. By reminding your metabolism where maintenance is, the body continues to burn at the higher caloric level, giving you far more food to eat and still burn for fat loss. Every 4-6 weeks you should take one week off back at TDEE. If you choose to go 8-10 weeks, then a two or more week break is needed. Biggest thing to remember is this is NOT a quick fix diet! 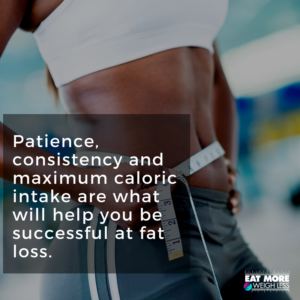 Patience, Consistency and maximum caloric intake are what will help you be successful at fat loss.